Canadian-based Chariot Carriers has issued a recall for some bicycle trailers and conversion kits. Recalled trailers have serial numbers from 1205-xxxx to 0710-xxxx (representing manufacture dates December 2005 through July 2010) located the left side on the frame. Recalled conversion kits have hitch arms that attach the carrier to the bicycle with model number 2010053 printed on a label attached to the aluminum tube next to the warning label. The bracket on the carrier is known as the Versa-Wing 2.0 ("VW2"). Older conversion kits without a label, but with a release push button located where the hitch arm inserts into the carrier, are also being recalled. 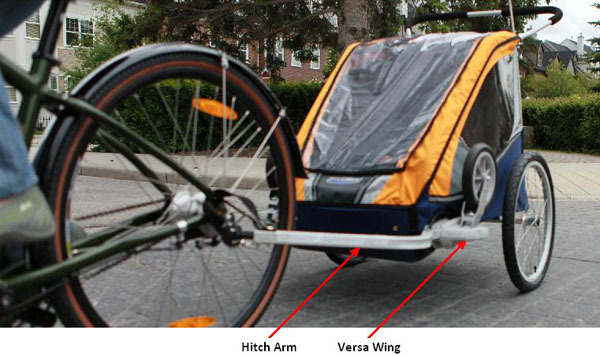 The bicycle trailer's hitch mechanisms can crack and break, causing the trailer to detach from the bicycle. This poses an injury hazard to children in the bicycle trailer. The company has received 2 reports of incidents in Canada. No injuries have been reported. Consumers should immediately stop using the recalled bicycle trailers and bicycle trailer conversion kits and contact Chariot Carriers for a free repair kit which the consumer can install. Consumers can receive a repair kit by contacting Chariot at 1-800-262-8651 between 10 a.m. and 6:30 p.m. ET Monday through Friday, or visit the firm's website (www.chariotcarriers.com). Approximately 41,000 of the recalled bicycle trailers and 64,000 of the bicycle trailer conversion kits were sold in Canada. The recalled trailers were sold from December 2005 through August 2010. The recalled hitch arms were sold from October 2002 through August 2011. Manufactured in Canada.